When Media is enabled in any engine configuration, SearchWP will attempt to extract the plain text contained within documents uploaded to the Media library. NOTE: Files MUST BE present in the Media library of the WordPress Dashboard. There is no way around this. * To verify your PDF has readable text, try to copy a sentence to your clipboard and paste it somewhere. If you cannot select or paste it, the PDF does not have readable text. As soon as a file is uploaded to your Media library, SearchWP will add it to the indexer queue like any other post (Post, Page, Custom Post Type, etc). 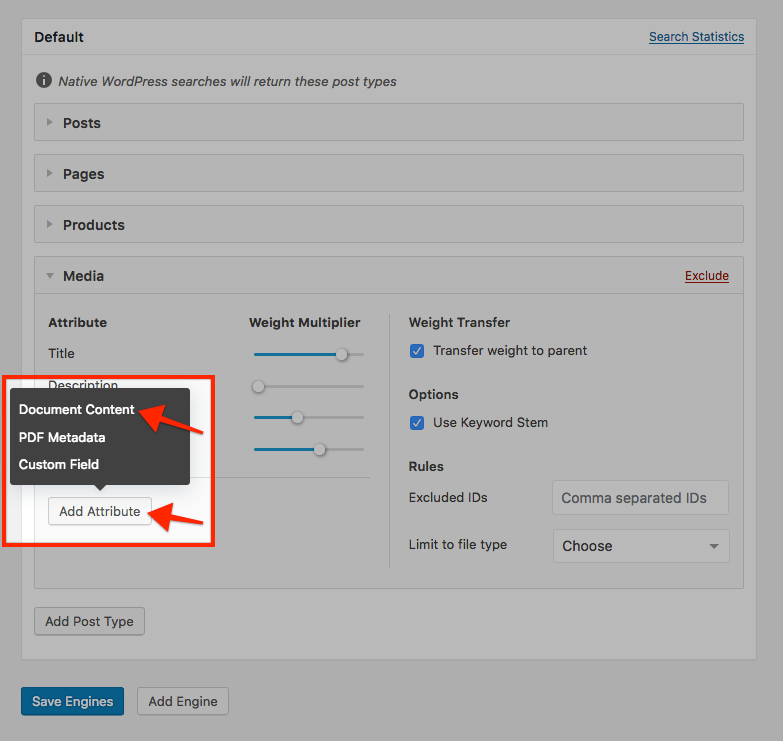 The indexer will use the information extracted by WordPress to determine whether it is a document that SearchWP can read. Tip: Documents take longer to parse than standard posts (Posts, Pages, Custom Post Types) because of the extra work being done to extract the text. Please allow adequate time for the indexer to work. PDF metadata (when applicable) is also extracted and stored with it’s own weight per engine configuration. SearchWP does not customize the way search results are shown, the existing results template is used. 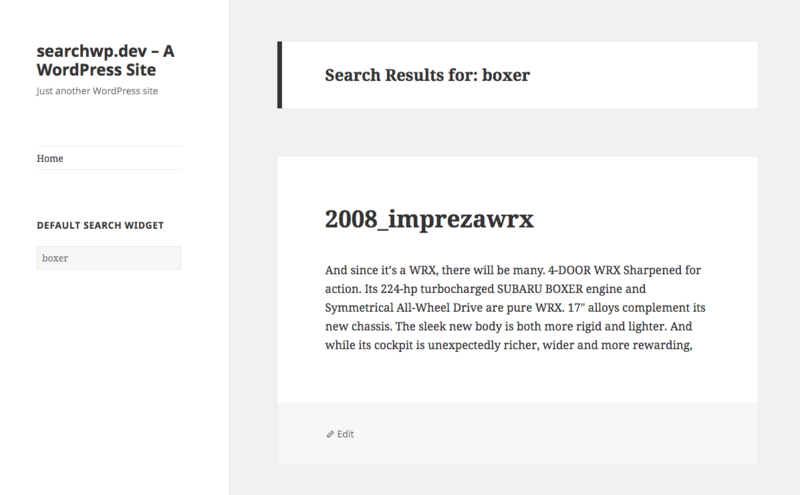 Like native WordPress search, Media results are shown as any other post type is. Media entries have a permalink and a title which are commonly used for each result in search results templates, including documents returned by SearchWP. NOTE: Line 6 of this snippet checks to see if it’s the default search results page. If using a Supplemental Engine you will need to remove the is_search() condition with one that matches your Supplemental Engine Page Template. With that in place, the excerpt will be filtered and if a Media result is being output, Term Highlight will find an appropriate excerpt to be used in the results template. Customizing parsed content — You have complete control over parsed document content, and you can customize it if you’d like. Linking to file instead of Attachment page — Many theme’s do not account for Attachment templates, and it often makes sense to link directly to the file as a result. Attributing Post Parent — SearchWP allows you to attribute keyword weight to the post parent, which is very useful when handling documents in search results. 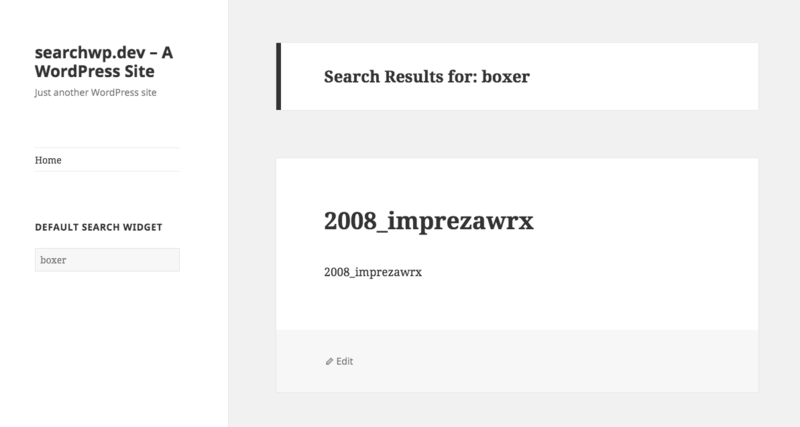 “SearchWP Failed to Index X Posts” — SearchWP’s document processing can sometimes cause a post to fail to index. Find out common causes and fixes in this KB article.